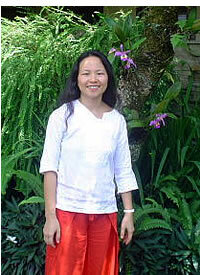 Pratibha is from Taiwan and has been working with colors, light and consciousness for more than 10 years. She travelled many countries learning many techniques which help people to improve their health, living more happy. She practices meditation. She went through an intense Aura-Soma training and is a certified Aura-Soma teacher, Osho Neo Reiki Master and a multidimensional body worker. In a playful way she combines the world of colors with meditation and says, “the rainbow is the bridge towards ourselves”. I apply a natural oil containing herbal essences on your body. It helps you to relax and to regain a new freshness. Reiki is gentle touching your body and filling it with the powerful life force energy. This natural energy moves through my hands and restores your own body´s healing power, helping to conquer old diseases. Putting many different crystals and gemstones on your body, you can experience how blockages or frozen parts in your body dissolve, you might feel harmonious in your body. This is a silent and enjoyable meeting with crystals. Through the color which you choose from more than 100 beautifully colored bottles, you will discover your true self. The bottles contain natural herbs, essential oils and the energy of crystals. The colors you choose reflect what you need for your life in this moment and what can support you in order to have a more happy and beautiful life. Balancing your body, the beamer light pen gives colored light to the meridians of your body and chakras, activating the regenerating of the body and balancing your energies. You might experence your body lighter and yourself contened.